The human creation myth of Sanamahi religion says when God Sanamahi was not able to make man to the satisfaction of the Supreme God, He revealed himself to him. And God Sanamahi made men in His image. According to Chingtamlen, the Meitei script was drawn/written with the life-blood of god. The Meitei script is called eyek, which may be broken down into e-yek — blood + draw. The alphabets symbolizing various body parts are representative of the replicas of human body created from the divine. This is also evident from the interpretation of the word Meetei given by Nondrei Khuman (e-pao.net: Reclaiming the Meetei Scriptural Knowledge for a Harmonious World) which trace the root words mee (image [of God]) and atei (other). Those who were created in His image were Gods and those who were image/copy of the God became man. The Bible also says man was made in the image of God. Why was man created in the image of God? The question may be rephrased to: Why creation had to be in the image of God? As human imagination is replete with anthropocentric views, I wasn't curious: most of the aliens portrayed in movies look like man (more than any plants or animals), only they have larger heads; not just biologically but also spiritually man is considered more advanced (only after you are born as all kinds of animals, with spiritual growth, you earn the right to be born a man and attain enlightenment in this form). So it is easy to become complacent and assume that it is this human-centric world view that got incorporated in the creation myth: we human look like god, other animals, maybe not that much. But recently I came across a podcast about a faith/religion called Gnosticism (howstuffworks.com). This led me to question my above assumption and allow possible other explanations. First, I would like to quickly point out that I do not in any way intend to denigrate or question Christianity, but to dwell upon Gnosticism purely to understand the probable origin of the idea/notion pointed out above. Gnosticism is a pre-Christian faith, although there were overlaps between the gnostics and Christians at the beginning. Gnostics interpreted the Bible and other Holi books differently. According to the gnostics, at the beginning, there was the undefinable, all-inclusive God (here I use capital 'G' to differentiate the Supreme God from personified or lesser gods). This would be somewhat similar to the one represented by ama (meaning one in Manipuri). As per late Chingtamlen, this is the formless and undefinable (energy?) that existed at the beginning. Everything originates from this. The gnostics say this Supreme God had a thought. But what can something that is all inclusive think of but itself? There cannot be any other thing to think of! This thought was hence a copy of itself (God) that was created. The fact that Snamahi was not able to make man to the satisfaction of the God, and God had to reveal himself to Sanamahi shows the imperfection of Sanamhi as a God (that he was less capable than the God). In Gnosticism also, man was created by a lesser god. The Supreme God created gods in pairs, male and female deities. However, in both traditional Manipuri religion and Gnosticism, there is something in man in essence that is related to God. There is another part in man that bogs him down and stops him from realizing this higher essence (Godliness). In Gnosticism, God sends His spirit and the lesser god puts that into man along with the power he had stolen from God. When he realizes the Supreme God wanted to take back this power by putting godliness in men (thereby making him realize the Supreme God), the lesser god puts material body over the creation to tie him (the man) down to this world. So here Gnosticism fills a gap in mythology that Sanamahi religion leaves out. It is the material body that bogs and befuddles man from realizing his higher form (godliness). It may be relevant to mention here that Osho called himself 'the guru of the rich' because he said the poor were so worried about their next meal (basic necessities) that they are unable to focus on the higher purpose of life, that is, spirituality. Apparently, materialism often comes in the way of our spiritual development is a long and widely held view. Gnostic books were probably destroyed before the current form of Christianity became prominent/dominant (part of the belief system was however absorbed into Christianity). However, some books have been dug up from near Nile (Egypt). 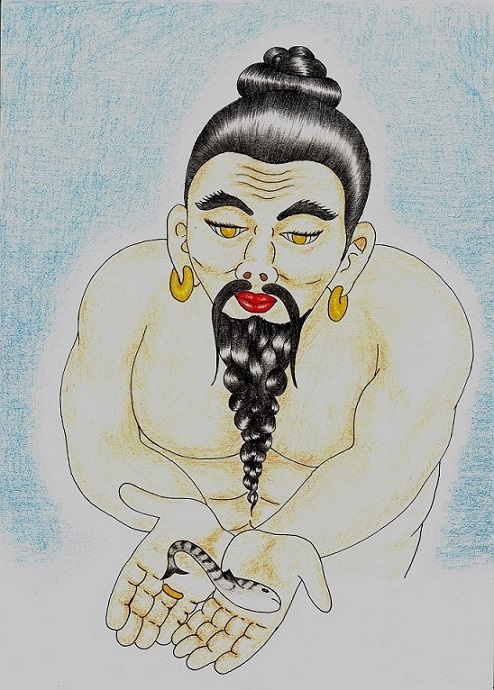 As an old (and extinct) religion that was prevalent in regions from where humans have evolved and migrated from, one cannot help wondering if it served as one of the tributaries of Manipuri mythology. This article was webcasted on May 04, 2017.